Weekly no-reserve auctions end Thursday. This kit supplies parts to repair or make a 3-tip spray boom. 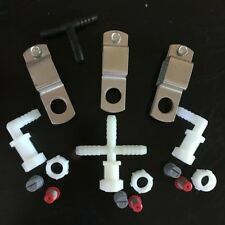 (3) nozzle body nuts. (2) 3/8" nozzle body elbows. (1) 3/8" nozzle body cross. 1.45N.m & 5300 r/min! 25-45J! Local Free shipping! It features a 1 GPM Ironton pump with durable chemical-resistant Santoprene and Viton® components. The 8-gallon tank is UV-resistant and compatible with virtually all pesticides. 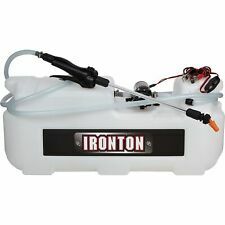 Gallon marks molded into tank make it easy to monitor fluid levels. Category 1 three point hitch system. Three Point Hitch. This durable draw-bar will withstand just about anything thrown at it. 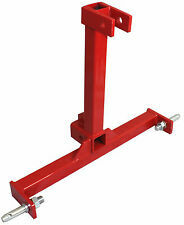 Will accept a standard 2" X 2" hitch for moving around your trailers. These are High Lift Blades with a 1/2" mounting hole. 1-937-444-4300 phone. 1-877-885-4300 toll free. If you need to shorted the shaft slightly to allow for proper clearance remove the shaft from the adjustable slip clutch, slide the two sides of the PTO apart and cut an equal amount off of each side as needed, reinstall the PTO shaft to the adjustable clutch and recheck for necessary clearance. Our toll free number is 1-877-885-4300. This PTO will fit mowers from Howse, Big Bee, Bush Hog, Woods, International, King Kutter, Taylor Pittsburg, Kodiac, HawkLine, Rhino, Razor, Fred Caine and many more. 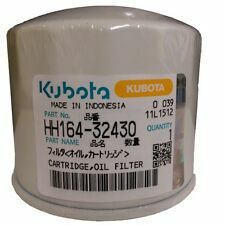 Oil Filter for Kubota B1550, B1700, B1750, B20, B21, B2100, B2150, B2301, B2320, B2400, B2410, B26, B2601, B2620, B2650, B2920, B4200, B5100, B5200, B6100, B6200, B7100, B7200, B7500, B7510, B7610, B8200, B9200, BX2200, BX22, BX23, BX2660, BX2670 Tractors. J ohn Deere (C1098JD): fits John Deere dozers, graders,backhoes, etc, This is the most common JD key. Replaces: John Deere part AR51481. Replaces: CAT #5P-8500. Replaces: CAT #8H-5306. Set of 10 of the most commonly used ignition keys on construction sites. We match the pairs as best we can. There are NO perfect pairs. The handles are made out of Oak. 3 NEW GENUINE KUBOTA OIL FILTER. MADE TO A HIGH QUALITY SPECS. This shaft features a two disc friction disc clutch 6" Across. This specific slip clutch uses Belleville spring technology. This clutch works similar to a coil spring clutch, but you just turn the bolts back to loosen the pressure on the linings, then tighten them back to put the pressure back on. The length diagonally from the corner to the tip is 18". HEAT TREATED PRESS ON TIP. This 3 point hitch has a standard 2" receiver to moving trailers around without getting off your tractor. The side lift pins will turn inward for small tractors like the BX Kubota or outward for normal sized tractors. Rotation- Clockwise auger rotation; no reverse gear. Note Earth Auger Bit is Not Included . Quick Start- Large manual recoil startup provides reliability and allows for quick starting. Start Type: Manual Recoil. Replaces Part Numbers : 8N9510C-HD, 8N9510C, TSX241B, TSX-241B, TSX241C, TSX-241C, TSX33,9N9510A, B3NN9510A,TSX241A, TSX241B, TSX241C,FSC30-0032. 8N9510C-HD Carburetor Carb for Ford Tractor 2N 8N 9N 8N9510C. Be sure to check for clearance. Large sized mirror at 7" x 12". There are multiple pictures to give you an idea of the mirror head and mounting assembly. Heavy duty mirror head body moulded out of thick ABS plastic. 9N1202412 NEW Ford Tractor 12-Volt Ignition Coil 8N, 9N, 2N. Part Number: Ford 9N1202412. MPN: 9N1202412. Replaces: 9N1202412, 9N12024-12V, 9N12024. This Ford tractor part replaces 9N1202412, 9N12024-12V, 9N12024. Adapter for RanchEx Category 1 Quick Hitch (SKU 102851). Adapter for Cat. 1 Quick Hitch. AMAZING SUPPORT. Tractor 1-3/8" 6-Spline Over-Running Clutch. 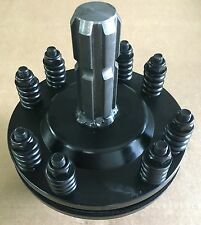 Tractor End: 1-3/8" x 6 Spline. Series: 75 HP, Standard Duty. Type: Quick Release. Fits several models including: AFM4216,AFM4214,AFM4211,AFM4014, AFM40168, AFM4011, AFM40133, FDR1660. Part Number 808-073C. CHECK OUT OUR OTHER PARTS! AM137329 JOHN DEERE. AM13733 JOHN DEERE. Crossed From: AM137328 JOHN DEERE. AM137333 JOHN DEERE. GY20850 JOHN DEERE. John Deere RIDING MOWER: D100 (42"). John Deere RIDING MOWER: D105 (42"). John Deere RIDING MOWER: D110 (42"). Hyster (1430): fits Hyster Rollers and Forklifts (p/n 186304. “166”) Caterpillar, Yale and Clark Forklifts, Gradall (166), Skytrak and Shuttleshift, Daewoo Skid Steers 430, 440, 450, etc., Mustang Skid steers, Ingersoll Rand Rollers and Komatsu Forklifts. FIT IH Farmall Tractor Cub LowBoy Cub 251234R91 251234R92 Carburetor w/ Gasket. 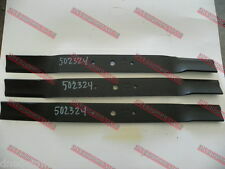 Part Numbers 251234R92, 251234R91, 71523C92, 405004R91. Replaces Part Numbers: 8N9510C-HD, 8N9510C, TSX241B, TSX-241B, TSX241C, TSX-241C, TSX33. Heavy Duty. Original Marvel-Schebler Design. Distance between Lower Arms: 27.5". How long will it take until I receive my order?. - Tractor Top Link to Bottom Spacing: 18". - Lower Link Center-on-Center: 28.75". - Weight: 60 LB. 5/8" Locking Hitch Pin with 2 Keys and Cover Truck Trailer Receiver Security HD. brass keys. Solid brass lock cylinder. If you feel our S&H prices are too high, we can provide you weight the item's weight so that you can confirm the prices for yourself. The unique bottom pin design makes it easy to use with smaller tractors like the BX Kubota,L3200 Kubota. 1 x3 point trailer hitch. 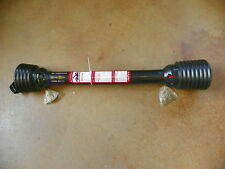 Standard 2" trailer receiver. Works on all 3 point Cat 1 Tractors. Strong powder coated finish. SIZE : 18x7.50-8 2Ply Turf Tire. Check the tire that you are replacing. For example, if your current tire is a 2PR, you can replace it with a 2PR or 4PR tire. TIRE WIDTH TIRE TYPE NOT FOR HIGHWAY USE. SIZE : 18x7.50-8 4Ply Turf Tire. Check the tire that you are replacing. For example, if your current tire is a 2PR, you can replace it with a 2PR or 4PR tire. TIRE WIDTH TIRE TYPE NOT FOR HIGHWAY USE. Manufacture Part Number: 251234R91 251234R92. Interchange Part Number: 251234R91 251234R92. Other Part Number: 251234R91 251234R92. 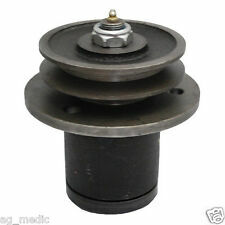 Replaces OEM Parts No: 251234R92, 251234R91, 71523C92, 405004R91. Model: Cub, Cub LoBoy 154. • For all mowers using oem# GX22151. Benefits of the HXT blade are sharper and longer lasting cutting edges. More resistance to bending. • (2) Blades for42" cut. We have over 30 years experience in agriculture. Komatsu Ignition (KOM): fits Komatsu 787, 646, 648 etc., Komatsu Forklift, Kalmar, Dressta, Sakai Forklift, Komatsu part #TR2611434. Hyster (1430): fits Hyster Rollers and Forklifts (p/n 186304. “166”) Caterpillar, Yale and Clark Forklifts, Gradall (166), Skytrak and Shuttleshift, Daewoo Skid Steers 430, 440, 450, etc., Mustang Skid steers, Ingersoll Rand Rollers and Komatsu Forklifts. Part Number: 88663. Fits models MTH600, RDTH72 and more. Stop in and see our 2 warehouses with more than 50,000 square feet. 1-1/16" Belt Groove. Up for sale is 1 BELT for the king kutter RFM-72 finishing mowers and also fits the county line 4' models that take one belt. The machine only takes 1 belt. We carry all kinds of agriculture and lawnmower parts. Replaces FERRIS SNAPPER KEES. Snapper RIDING MOWER: EZT20501BV (44" Deck). Snapper RIDING MOWER: ZT18440KH (44" Deck). Snapper RIDING MOWER: ZT18441KHC (44" Deck). Snapper RIDING MOWER: ZT19441KWV (44" Deck). 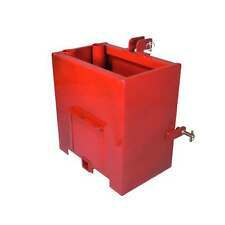 1 x Clamp On Trailer Receiver Hitch 2" Tractor Bucket. 2" bucket lip gap. High quality alloy cup set screw. Standard 2" receiver. Height: 7". Width: 2 1/2". Length: 18". Part number 505017. Part Number: 505017. Ohio Residents Only.